These mining tips aren’t strict guidelines. Try your own methods, too. Cave mining is challenging yet fruitful. To start, you must find a large cave — perhaps while working on another mine or exploring. If you can find a large cave, you have a useful resource at your disposal. Cave mining lets you obtain many scattered resources without wearing out your tools trying to plow through stone. However, caves can sometimes be deadly labyrinths, and you may lose your items if your avatar dies. You have to decide whether the payoff in resources is worth the risk of losing them. When mining in a cave, simply light the way and skim the walls for minerals you can use. Iron ore is common, but keep an eye out for it to collect it, anyway. If you can mine deep enough, you may find useful materials such as redstone, gold, and diamond. However, you may also come across lava — the bane of careless miners. Lava flows slowly and destroys items (and you! ), so avoid it and ensure that your precious ores don’t fall anywhere near it. Sometimes, while exploring or mining, you come across ravines. These narrow, deep gaps can appear underground or on the surface. Although ravines can contain lots of lava and monsters and are cumbersome to navigate, they expose a lot of surface area and are useful for finding minerals. 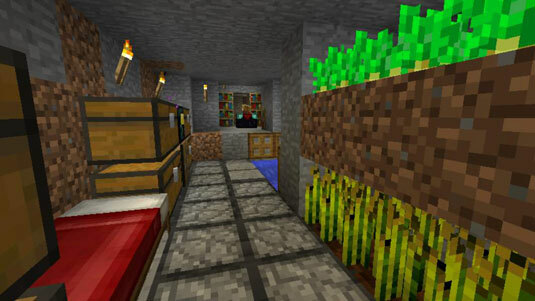 A ravine also provides an excellent shelter because mobs cannot spawn on the walls of the ravine. You need to light the bottom around you using torches. If you enjoy mining and spend most of your time using a pickaxe, build a little rest area underground. You might want to include a bed, chests, and even a farm to provide you with food. Your house doesn’t have to be located on grass. Dig any way you want, just do not dig straight down; you might fall into a pit, or into lava. The smallest tunnel that your character can fit into is one block wide and two blocks tall. Use torches to light the area, or else your tunnel will attract unwanted guests. Build more tunnels that branch off from the first one. 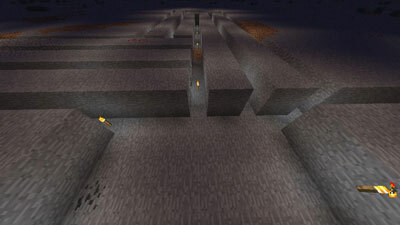 By building extra tunnels that split off from the main route, you can look for ores over a large area. Position the tunnels two blocks apart to be able to inspect a large surface area and not miss anything (see the following figure). Branch mining is effective because you can acquire a lot of ores efficiently. However, this type of mining consumes many tools because of the volume of stone you dig through, and produces much more cobblestone than valuables. Branch mining is a helpful method if you have patience, and a project in which you can invest your fortune of cobblestone. Make a small 4 x 4 area. Use this space as a staircase to get to the surface along with your chests, bed, and furnaces. Make 2 x 2 tunnels in all four directions. This step determines how many branch mines you have, so dig a reasonably big tunnel. Make sure the tunnels are centered with your base. Dig one of the tunnels until your inventory is full. Make tunnels in the “corridors” you created in Step 2. The spacing is up to you, but for maximum efficiency, put them about six spaces apart. If you want to be thorough, put them two spaces apart. It will get all the ores for sure, but you might find that you’ve already collected all the ores from half of the tunnel. Keep digging until only three spaces remain in the inventory. Then head back. 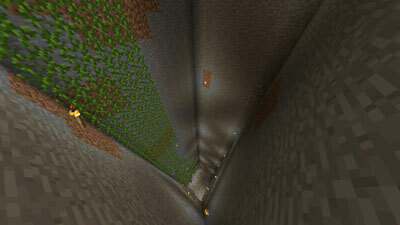 Emerald ore can be found only in the Extreme Hills biomes and spawn only 1 ore instead of a vein. Only 3 to 5 emerald ores in one chunk. Emerald ore isn’t the only ore that is found only in a certain biome. Nether quartz ore is found only in the Nether (the “Hell” biome), but unlike emerald ore, nether quartz spawns in veins. In the staircase method, you dig deeply and quickly to search for caves, find a suitable spot for a branch mine, search for minerals en route to destinations, or simply build an attractive staircase. Descend only one block at a time, or else you can’t get back up. The following figure shows a staircase, which requires a minimal amount of work. You can craft stair blocks (wooden stairs, cobblestone stairs, and others) to make the staircase’s ascension less taxing (your character becomes hungry when jumping too many stairs). You can also raise the ceiling of your staircase to make your descent faster and less cramped. 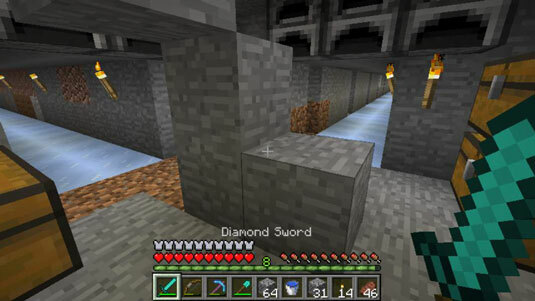 Many players build a staircase mine to Level 5 or Level 12 because those are the most diamond-rich levels. At that point, you would build a branch mine. However, you might encounter a cave before you reach those levels. 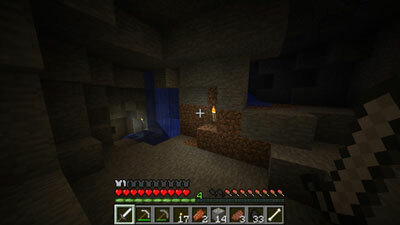 You need to immediately light up the caves and kill the mobs within. Caves are usually the most ore rich, so do not miss the opportunity. A quarry is the simplest type of mining, and digging one is a useful way to gather lots of cobblestone — and to ensure that you don’t miss any materials. Simply dig a rectangle out of the ground, and then another one under it, and so on, until you have a sizeable hole from which you’ve unearthed every possible resource. 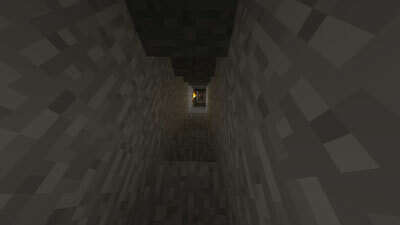 Build a stairwell or ladder to exit and reenter the quarry. The following figure shows a classic quarry. Although quarries produce lots of materials and can be mined safely, digging one requires great patience and generally isn’t advisable. However, if you take that route, you can easily repurpose quarries into underground buildings.